Auto Lube Systems: Why choose FLO Components as your supplier of lubrication equipment and central automated greasing systems (autogreasers)? – FLO Components – Automatic Lubrication Systems Specialist in Ontario and Manitoba. Auto Lube Systems: Why choose FLO Components as your supplier of lubrication equipment and central automated greasing systems (autogreasers)? WHY CHOOSE FLO AS YOUR LUBRICATION EQUIPMENT PROVIDER? FLO Components Ltd. is an automatic greasing systems specialist and has been a leading supplier of “Total Lube Solutions” to major manufacturers since 1977. With offices in Mississauga, ON and Winnipeg, MB, FLO uses application expertise, qualified installation and service technicians, combined with high-quality products to provide cost effective Solutions for all types of manual lubrication, central automatic lubrication and fluid handling applications. 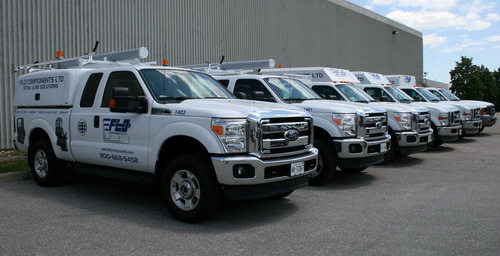 We design, assemble and install the highest quality automated systems, using components from industry leaders such as SKF, Lincoln, Trico, Perma, Oil-Rite, Graco, Petro-Canada, Anderol and other world-class manufacturers. Experience – We have helped industry leaders improve productivity and reduce operating costs with “peace of mind” solutions for over 40 years. Flexibility – We meet the requirements of your most demanding applications with the largest range of products and services in your local area. Fast Response – Guaranteed within 24 hours. Expertise – All our technicians have a skilled trade ticket, are participating in an apprenticeship program or have applicable industry experience. We service products from Lincoln, SKF, Vogel, Mityvac, Alemite, RPM and Graco, as well as most other major lubrication equipment manufacturers’ brands. Convenience – Our industry exclusive Mobile Workshops and our ability to create your solution “on site” frees up your resources to focus on your core business. Trust – 90% of our business comes from customers who have relied on us for over 20 years. Contact us now – choose FLO as your lubrication equipment provider.